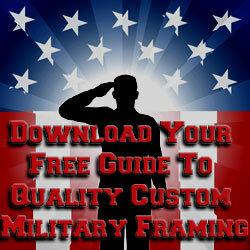 Military shadow box framing is one of our custom picture framing specialties. Our mission regarding military shadow box design is simple: produce an aesthetically pleasing, high-quality shadow box that will preserve objects to be cherished for generations. The objects and mementos placed into the shadow box are there to reflect the character and uniqueness of an individual’s achievements. Those objects are also there to remind them of something personal or to commemorate a significant military event in their life. This is illustrated by the 2nd Brigade Combat Team, 3rd Infantry Division military shadow box on the left. This shadow box features a collection of military memorabilia. The collection includes a custom embroidered replica of the unit patch, coins, distinctive unit insignias, flag patches, decorative knife in a sheath, and an embroidered name and statement of appreciation. All objects in this example are top mounted to a single black acid-free suede mat. The objects were secured in place using acid-free adhesives with the knife being held in place with black monofilament line. The embroidered pieces were hand sewn onto the mat. Surrounding the mat and objects is a gold tone beaded fillet inside a deep ornate gold tone wood shadow box frame. Covering the mat and memorabilia is 99% UV protective glass to prevent fading. The example on the left reflects a monumental moment in a soldier’s life. The memories of that time are preserved for future generations by creating a military shadow box that reflects something special. In this example, the shadow box reflects a tour of duty in Iraq with the 6th Squadron, 8th Regiment. The military shadow box items include the award of Gold Cavalry Spurs into the Order Of The Combat Spur, a cavalry belt buckle, the certificate, a 12” x 9” custom embroidered cavalry guidon with crossed swords, and an officer’s dress blue shoulder board rank. 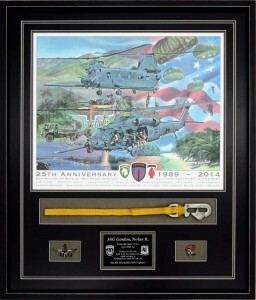 This military shadow box example features triple acid-free mats. The top mat is etched black, the second mat is red suede, and the third mat is etched black. Acid-free foamboard was layered to provide depth for the spurs and the buckle. The layering also separated the objects from the glass. Surrounding the objects is an open V-groove that provides depth and symmetry to the design allowing the red suede mat to peek through in a precise rectangular fashion. A black wood shadow box frame with a gold-tone fillet to the inside edge surrounds the mats. The mats and the objects inside the frame are covered with 99% UV-protective conservation clear glass to prevent mat and object fading. Producing a premium, well-designed, high-quality shadow box takes time, experience, and quality materials. What makes us qualified to frame your personal mementos? For that matter, why should you trust us with something that special? The community surrounding us is strongly military-oriented. We have earned their trust by framing scores of heirloom objects. 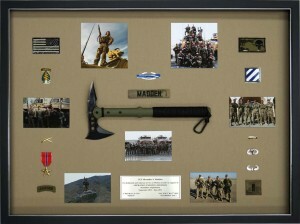 The framed Hawk Axe on the right represents trust placed in us to frame and design a shadow box capturing a commander’s tour of duty with his men. The uniqueness of this design is based on the decision to top mount the objects. 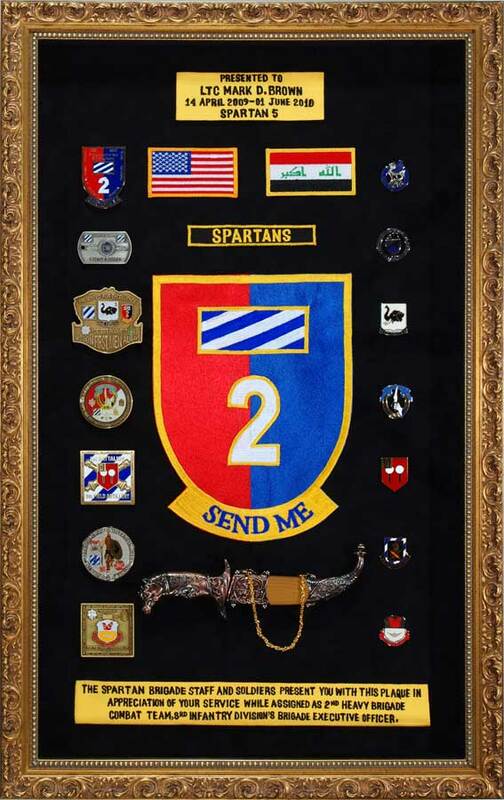 The shadow box includes deployment photos, the bronze star, ranger tab, Special Forces Group Airborne Army CSIB, an air assault pin, the parachutist’s pin, rank patch, 3rd ID insignia, name tape, infantry insignia, and a custom silver satin nameplate. An accent to the design of the shadow box includes a silver tone fillet placed to its inside edge. 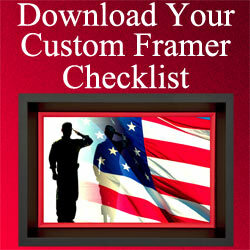 The photos were custom printed by us which is a service we provide to all our frame customers. The Ranger Hawk Axe is secured in place with black nylon cord. The objects are top mounted onto an acid-free khaki linen mat. Our retail shop serves and is near a number of local military installations along the Georgia coast. Serving our military customers has taught us about the tastes and design requirements that make a military shadow box artistically pleasing. As experienced framers, we run both a retail picture framing shop and an online e-commerce store. 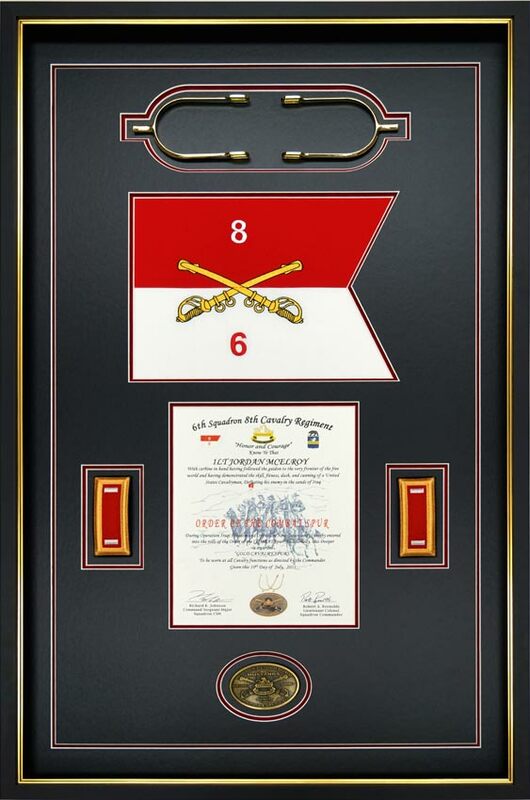 The scope of our experience framing for the military community includes custom framing display cases, picture frames, framed guidons, framed military diplomas and awards, framed military medals and ribbons, and military shadow boxes. We serve both active duty military personnel and veterans seeking high-quality shadow boxes and display cases. 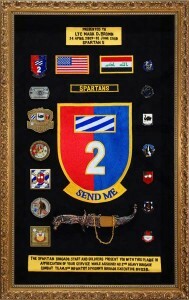 Looking For a Quality Military Shadow Box? There are a lot of military shadow boxes available on the Internet. Most shadow box retailers will ship you an empty display case. When it arrives, it is up to you to design and place the objects inside the case and hope everything fits properly. And then you must have the knowledge of how to secure objects so they do not fall, become damaged or prematurely fade. Frankly, buying an empty military display case is the most inexpensive way to purchase a shadow box. Dollar-wise, it will seem cheaper than having a qualified custom framer make the shadow box for you. However, don’t let a low price mislead you into believing you are getting the best value for your money! A low price is misleading because the skilled services that custom framers offer are often overlooked by internet shoppers. The design skills of an experienced military framer are invaluable when creating a one of a kind military shadow box. A second factor which is almost never mentioned by internet shadow box vendors is whether or not their display cases use archival / conservation framing materials and techniques. Poor quality, acid-borne materials are an unseen cancer that will kill the longevity of your prized mementos! 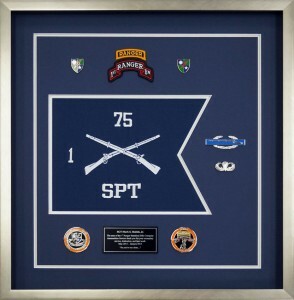 The 1st Battalion, 75th ranger regiment shadow box example features a 12″ x 9″ custom embroidered cotton mini infantry guidon. The objects accompanying the guidon include a combat infantry badge, custom nameplate, Ranger coins, distinctive unit insignia, a parachutist badge, and Ranger tabs. 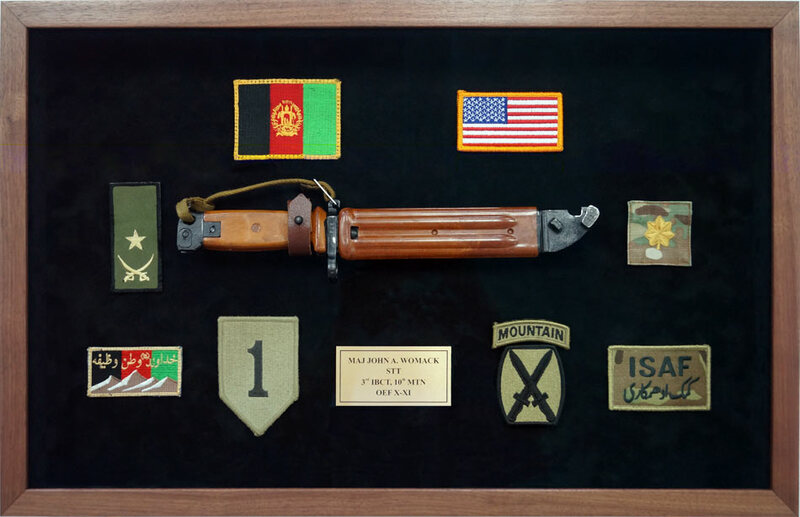 The Infantry guidon is the centerpiece in this collection of Army Ranger memorabilia. The design captures a memorable time in a soldier’s career. As part of our archival/conservation custom framing techniques, we only used acid-free mats, acid-free materials, and 99% UV protective glass. The guidon was sewn onto the acid-free mat board to prevent it from sagging or dropping in the future. The shadow box frame is all wood with a brushed silver finish. The shadow box also includes an acid-free navy blue paper top mat and a white paper bottom mat. An open V-groove surrounds the shadow box mementos and shows the white bottom mat peeking through. The open V-groove is our signature design element that adds depth and symmetry to the shadow box. All objects in the shadow box, with the exception of the guidon, are top mounted. The use of acid-free materials and 99% UV protective glazing will protect the objects inside the shadow box against premature fading. Always insist upon conservation framing for your shadow box. The value of safeguarding irreplaceable objects inside a military shadow box is often overlooked. Producing a design that matches the colors of the objects, such as medals and ribbons, to mats and frames, requires experience. The services of an experienced, quality custom picture framer can transform a bland-looking military display into a work-of-art with eye-popping appeal. This work-of-art cannot be rivaled by a plain wood display case with a hinged door! This is an example of a military shadow box constructed after a soldier’s deployment. The shadow box contains the ISAF sleeve patch, 10th Mountain Division patch, Afghanistan Commando Special Forces patch, 1st Infantry patch, rank insignia, Afghanistan and American flag patches, and a combat knife. The objects were secured using conservation/archival framing techniques. All objects, except the knife, were top mounted onto a single acid-free suede mat with acid-free adhesives. The knife was mounted using black monofilament line that made it invisible against the black suede mat. The depth of the shadow box frame is about 1.5″. This depth was required to secure the knife and prevent it from hitting the 99% UV Museum glass. A satin gold tone custom nameplate is centered on the bottom row. We have considerable experience framing knives. We have framed knives ranging from hand-made mastodon bone-handled collector’s knives, to civilian and military knifes. We have framed knives with and without sheaths. 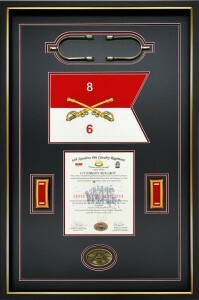 What distinguishes the construction of our custom military shadow boxes from the scores of online providers is simple. First, we have a conversation with our customers about what they want. Communication is a key component for a successfully designed military shadow box. After the initial consultation, we produce a detailed design and communicate that design to our customers for approval. Another aspect of our military shadow box construction that differs vastly from our online competitors is the way objects inside the shadow box are held in place. The example on the left demonstrates the way objects should be secured. 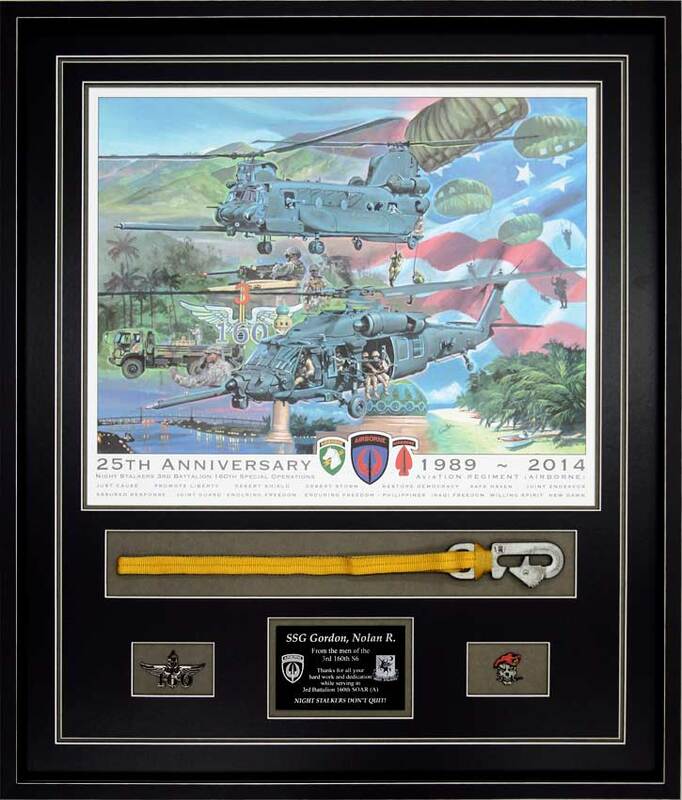 Featured in this military shadow box is the 3rd Battalion 160th Special Operations Regiment Anniversary print. It is framed, accompanied by a 160th Special Operations metal insignia pin, unit coin, and laser-engraved nameplate. Directly below the print is a parachute static line in a window opening. The static line was hand sewn onto an acid-free mat board to secure it in place and preserve it. The shadow box includes triple acid-free mats. The print is dry mounted flat onto an acid-free reversible foamboard. Using a reversible foamboard ensures the print will remain flat in the shadow box over the years. The reversible foamboard also provides a way to remove the print later if desired. Using reversible acid-free foamboard is highly recommended if your art is collectible. Covering the mats, print, and objects is 99% UV protective glass. The shadow box is framed with a black, all wood moulding, with silver line edges. Acid-free attachment devices that include adhesives, hinge mounting, clips, cords, etc. Using acid-free attachment procedures prevents off-gassing. Off-gassing will lead to the premature, irreversible deterioration of the objects inside the shadow box. Frame sealing tape: This prevents acid migration from the wood frame to the mats, which results in irreversible damage to the mats, documents, photos, and items inside the shadow box. Acid-free foamboard spacers are used in our designs featuring double, triple, and quadruple mats. The foamboard spacers enable us to provide depth for objects such as coins, insignias, pins, medals, ribbons, flags, guidons, or any objects that require depth. In addition to the design elements of depth and dimension provided by acid-free foamboard spacers, they serve to prevent objects inside the shadow box from touching the glass and breaking it. Acid-free acrylic spacers are used to separate single matted, flat surface mounted objects from touching the glass and breaking it. Wire hangers or wall buddies are screwed into the frame to secure it on the wall. Plastic coated wire matched to the weight of the frame is secured to the wire hangers. This prevents the frame from falling. Premium wood frames are used. We do not use plastic frames, metal frames, or MDF composite moulding for shadow boxes. The number of objects and the size of the objects framed influence a military shadow box price. Many competitors charge by the “opening” for objects inside the shadow box. We do not charge this way. Our prices are based on other factors—generally the overall size of the completed frame. We exclusively use 99% UV protective glazing. We offer a number of options for this glazing. Our standard glazing for local pick-up customers is Conservation Clear Glass. Our standard glazing for shipping is Conservation Clear Acrylic. We don’t ship glass in shadow boxes due to the high risk of breakage. Another premium glazing upgrade is Museum Glass or Optium Museum Acrylic. Museum Glass or Museum Acrylic offers the advantage of being nearly invisible. We offer a number of wood moulding selections best suited for military shadow boxes. For shallow depth shadow boxes, our preferred dark brown moulding with metal corner caps is a favorite choice. For Shadow Boxes that include folded flags and items the size of knives, a deeper moulding is required. These come in black, ornate gold, brown wood, mahogany tone, ornate gold, champagne, and brushed silver. As an added accent design feature, all wood fillets can be utilized in colors to match or contrast with the shadow box. Mat selections influence prices, also. Only acid-free mats are used to construct all military shadow boxes. Depending upon your design requirements, we offer the following styles of acid-free mats: suede mats, leather mats, silken mats, linen mats, and paper mats. Dark suede mats are perfect for adding a rich look, depth and contrast to a design. Silken and linen mats work well with flag displays. Paper mats offer a general purpose framing option to the premium suede, silken, leather, and linen mat selections. The size of the photographs will influence the price of the shadow box. We offer a service for printing photos using archival grade papers and inks. This service is only available to customers that include the photos in the shadow boxes that we design and build. Custom engraved nameplates are an option. Looking for Military Shadow Box Ideas? Our customers create military shadow boxes for a number of reasons. In almost all cases, the motive is to preserve memories that represent a significant event or a time in someone’s life. 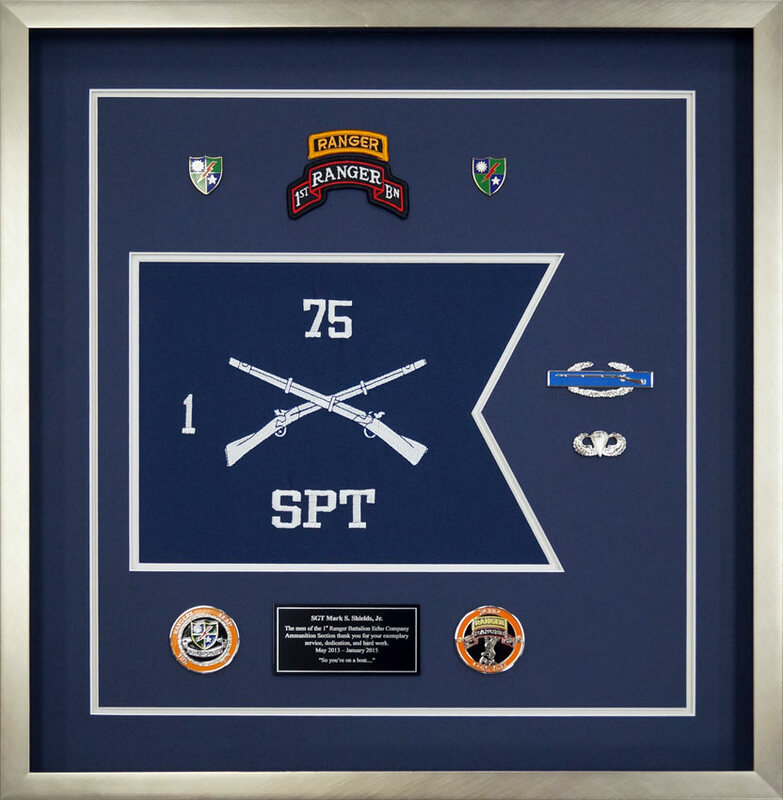 We create shadow boxes as retirement gifts, PCS gifts, change of command gifts, post-deployment gifts, and as going-away gifts. We invite you to contact us for shadow box framing ideas. For more information, or a quote regarding military shadow boxes, please contact us at 912-756-2781 or use our contact form.